Moneydance is a full-featured personal financial management application that includes features such as online banking, online bill payment, investment management, budget tracking, scheduled transactions, check printing, detailed graphs, reports and much more. Moneydance’s easy-to-use interface sets it apart from other financial software. Online Banking – Moneydance can automatically download transactions and send payments online from hundreds of financial institutions. Moneydance learns how to automatically categorize and clean up downloaded transactions. Account Graphing – Use the graphing tool to generate visual reports of your income and expenses. Set the graph type, the date range, and any specific settings for the type of graph you desire. Pop-up balloons display more information about the data being graphed as you move the mouse pointer over different regions of the screen. Graphs can also be printed or exported to image image files. 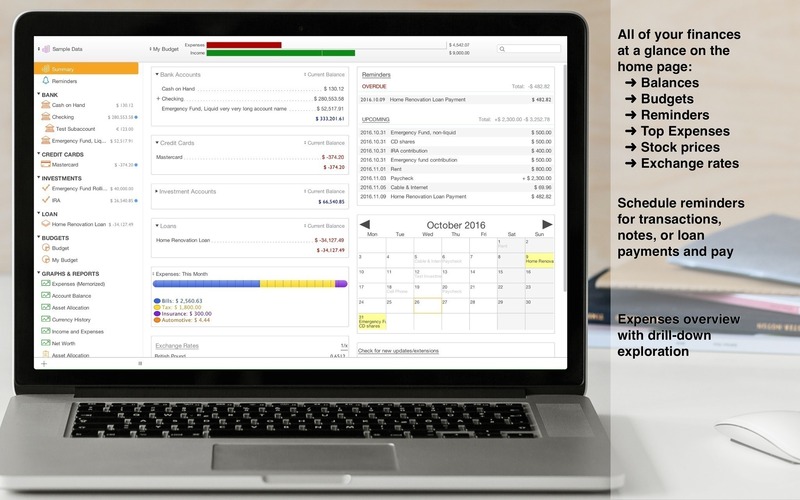 Reminders and Scheduled Transactions – Transactions and notes can be easily scheduled to remind you when they are coming up or are past due. Account Register – This is used to enter, edit, and delete transactions in an account. It is visually similar to a paper checkbook register, except the calculation of balances and sorting of transactions is all done automatically. Entering transactions is easier with the payee auto-complete feature; this reduces the number of keystrokes necessary for entering many similar transactions. Next story Aeon Timeline 2.3.16 – Timeline tool stimulates creative thinking. Previous story CrazyTalk Animator 3.31 – Create animations with easy-to-animate and modifiable actors and scenes. iCompta 6.0.12 – Manage personal finances. Money Pro 1.9.6 – Manage money like a pro.